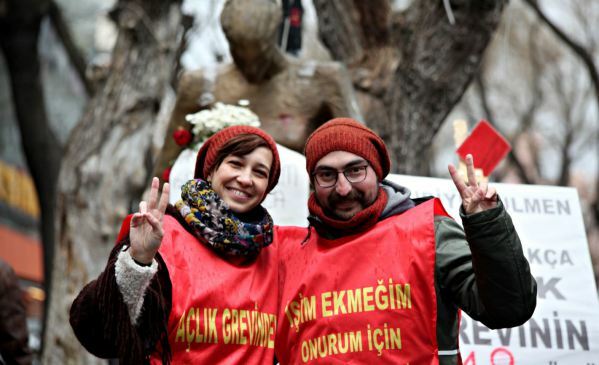 Nuriye Gülmen and Semih Özakça, two dismissed educators who have been on a hunger strike for 102 days, are now faced with heart failure, the t24 news website reported on Friday. Gülmen and Özakça were on a hunger strike when they were arrested on terror charges on May 23 in Ankara in the wake of a botched coup attempt on July 15, 2016. Gülmen was fired from Konya Selçuk University for her alleged ties to the faith-based Gülen movement. Özakça was a teacher at a primary school in Turkey’s eastern province of Mardin before he was purged over ties to a “terrorist” organization. According to the report, the lawyer for Gülmen and Özakça, Engin Gökoğlu, expressed concern over the health condition of Gülmen. “Nuriye is now using a wheelchair to meet us. The area where prisoners meet with their lawyers is usually in a short walking distance. But now she cannot walk without some support from a prison warden or without a wheelchair,” he said. Gökoğlu said Gülmen could not hold a pen or go to the toilet and that her condition is worsening. He added that Özakça would soon be faced with the same situation if nothing changes. Gülmen and Özakça protested for months in the same area of Ankara before they started their hunger strike. Both had been detained several times due to their protests. The first hearing in Gülmen and Özakça’s trial is set for Sept. 14. Gökoğlu said he is trying to change it since he does not know whether Gülmen and Özakça will be able to make it to the court on that day. The lawyer also added that he is preparing to file an application at the Constitutional Court for the dismissal of charges against Gülmen and Özakça and that if he receives no response in 24 hours, he plans to apply to the European Court of Human Rights.